Compare to shaving, waxing causing a prickly feel days after shaving. Waxing provides smoother and longer lasting results by removing the hair from the root. 1.Just plug in and rotate the knob to adjust temperature, the pilot lamp lights up and the heater starts working. Take appropriate amount of wax beans into depilatory wax heater to melt. 2.Heat the wax to a melting temperature, after the wax melted, spread a layer of wax with spatula on the skin along the direction of the hair growth. 3.After 5 minutes, feel the wax temperature disappears when the wax stripped, against the direction of the hair growth quickly Peel off in one quick motion to lessen the pain and enhance the effects. coated with skin cream. For large areas like legs or areas with sparse hair growth: strips are long and wide, and the wax is applied relatively thinly. The dried wax can be removed gently. For sensitive areas, loose skin or when working over short, coarse or dense hair growth: strips are narrower and wax is applied thicker. Apply in smaller sections, and remove wax quickly and firmly. The edges of the strip need to be slightly thicker to prevent it from breaking during removal. If it is too thin, it will just crack and break into a million pieces when try to remove it. ① Ensure the wax is not too hot before applying to skin. ② Do not use it on broken or irritated skin. ③ Do not use it if your skin suffered any adverse reactions to wax in the past. ④ Do not use it within 2 hours after taking a shower, or sunbathing. ⑤ If you are on medication that affects skin or you have a skin related disorder, consult your doctor before use. ⑥ Keep away from Children. 【Healthy Wax Beans】 Natural wax Ingredients can be widely used for full body, which has no irritation to the skin and can remove 98% of your body unwanted hair. 【Adjustable Temperature&Automatic Overheat Protection】The temperature range is from 160-240F. You can choose the suitable temperature for yourself. While the temperature is up to 240F,it will stop heating automatically. When the temperature cool down to 160F, it will start to heat up again. 【Easy Operation】 The wax heat only needs about 5 minutes, after wax melted, you just need applying it to parts where you want to remove the hair. Experiment proves that 2mm thick Wax is the most effective one to remove hair. Paint the wax on your body, when it is dry, tear it quickly. 【Note】 When you heat up the wax, please make sure the heating pot is dry and without any water. For the sake of cleaning and healthy, we advise you to heat up the share you need instead of too much. 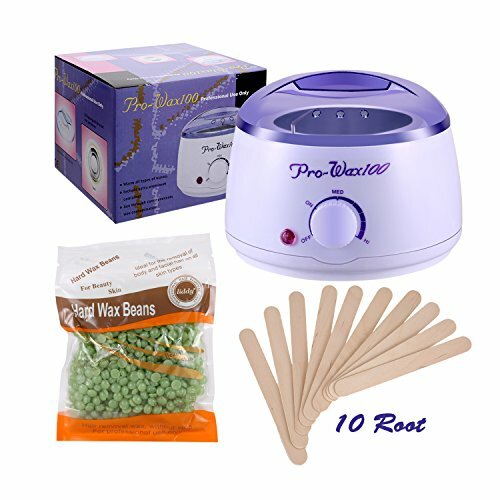 【Package Includes】 1 Wax Heating Machine, 1 Removable Wax Pot, 1 See-through Vented Cover, 1 Pack hard wax beans, 1 User’s manual, 10 Wax Applicator Sticks. This entry was posted in Waxing and tagged ACEVIVI, Beans, Both, designed, Hair, Hard, Parts, Remove, Special, Suitable, Unwanted, Warmer, Women.